Liying Universal High Elastic Bandage with Velcro closure Wear for Sports! Liying Universal High Elastic Bandage Wear for Sports! 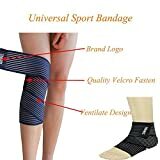 4.Professional focus on body healthy care during Sports ,good for prevent the injury,Shock absorption,Stabilizer suport,keep body band part warm and dry,excellent protection, especially when they are on running,hiking,biking,gym class,tennis,squash,badminton,or other fitness occassion.